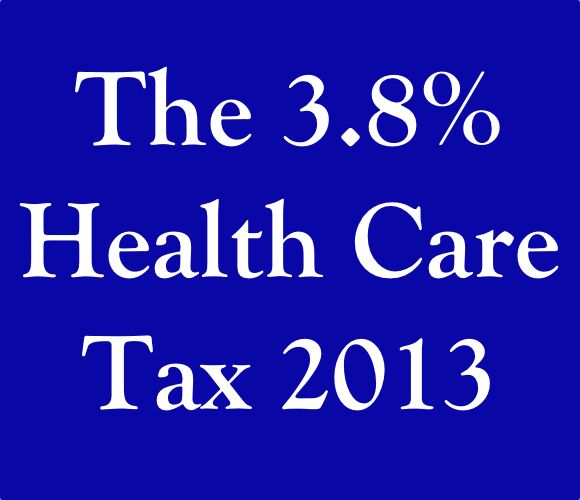 The 3.8% Obama Care Tax from 2013. Will It Impact Your Real Estate Sale? Beginning January 1, 2013, a new 3.8 percent tax on some investment income will take effect. Since this new tax will affect some real estate transactions, it is important for home sellers to clearly understand the tax and how it could impact a real estate sale from 2013 onwards. Note that this tax WILL NOT be imposed on all real estate transactions, a common misconception. Rather, when the legislation becomes effective in 2013, it may impose a 3.8% tax on some (but not all) income from interest, dividends, rents (less expenses) and capital gains (less capital losses). The tax will fall only on individuals with an adjusted gross income (AGI) above $200,000 and couples ﬁling a joint return with more than $250,000 AGI. The tax is not payable at close of escrow, but is due at the end of the tax year, if applicable. The Bridgers own a vacation home that they purchased for $275,000. They have never rented it to others. They sell it for $335,000. In the year of sale they also have earned income from other sources of $225,000. Note: If the Bridgers rent the home for 14 or fewer days in the course of a year, the rental income is non-taxable and the results in the year of sale will be the same as shown above. If the rental period exceeds 14 days in any year, then the rental income (less expenses) will be taxable and AGI would include not only the capital gain, but also some amount that is depreciation recapture. Disclaimer: This educational article is intended to provide you helpful information and useful examples, and not to provide tax advice. As always, it is best to consult your tax professional for your specific circumstance. I am Your Realtor for Your Real Estate Success. If you are planning to Sell your house, pricing it right is the most important first step. Call me for a no-obligation evaluation of your home, at 408-861-8026. My goal is to make you successful through a quick sale of your home bringing my core price setting skills, marketing skills, integrity, and exceptional service! If you are in the market to Buy your dream home, I can help you find the right home, and be there for you throughout the transaction.